When you develop your app with Fire App Builder, you should use an actual Fire TV device to test your app. See Connecting to Fire TV Through adb for details. However, if you're in a situation where you can only use an emulator, you can get by if you accept some limitations with the emulator. The emulator will work, but you can't click the media player buttons with your mouse. Mouse clicks generate motion events, which aren't supported by media played in Fire App Builder (you'll see an error in logcat that says "java.lang.ClassCastException: android.view.MotionEvent cannot be cast to android.view.KeyEvent"). As a result, the app will crash on the emulator if you use your mouse to click the media player's buttons. Instead of using your mouse on the media playback screen, to return to the previous screen after playing media, click the Back button on the right of the emulator (as indicated by the arrow in the following screenshot). Don't click the media player's buttons with your mouse. 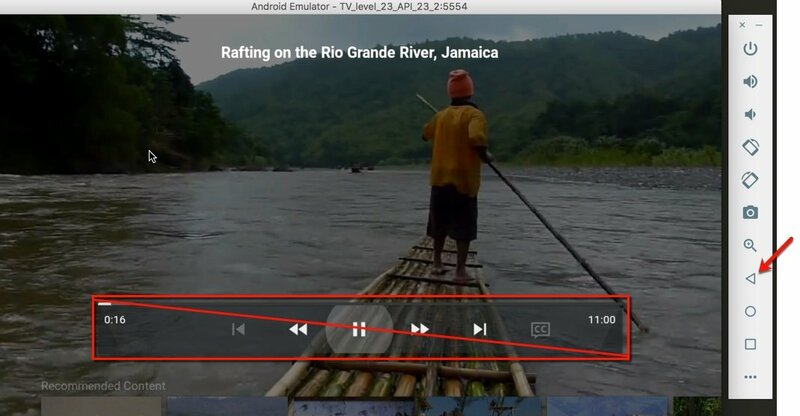 Outside of media playback, you can use your mouse to click wherever you want. Go to Tools > Android > AVD Manager, or click the AVD Manager button on the top navigation bar. Click the + Create Virtual Device button. Note: You can select one of the default TV profiles, or you can customize the settings by following the steps below. If you select a default TV profile, skip ahead to step 12 where you select a system image. In the Category column, select TV. Click the New Hardware Profile button. For the Device Type, select Android TV. For the Screen size, type the screen size you want (for example, 40). For the Resolution, type the resolution you want (for example, 1280 x 720). For the Supported device states, select only Landscape (clear the Portrait check box). 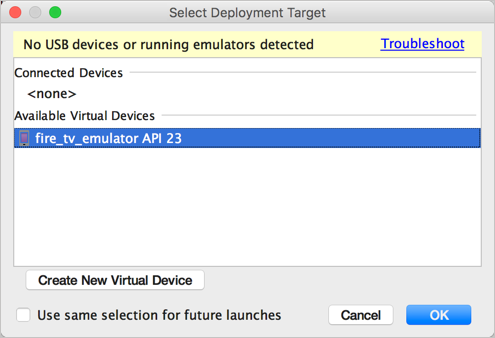 In the "Choose a device definition" dialog box, select the emulator you just created and click Next. The emulator is now listed as an option in your virtual devices. Note: If you chose a default TV profile, you must rename the device to remove any parentheses in the name. These parentheses cause an error when you run your app. (You'll see an error that says the "virtual device name contains invalid characters.") To rename your virtual device, while viewing your virtual devices, click the Edit button under the Actions column on the right. Then rename the device. Now you can use the emulator as usual. Just be careful when you play media. When you play media, don't click the buttons on the media player with your mouse. Instead, either use your keys or use the buttons to the right of the emulator as shown in the earlier screenshot.